Many large employers have formal college recruitment programs they use to recruit college students and alumni for job, internship, summer job and co-op opportunities at the company. Smaller companies also recruit on a less formal basis, posting new job openings as they become available. When a company has a college recruitment program they have easy and select access to candidates from colleges and universities. Most schools utilize a recruiting job posting service (like NACElink or Experience) to manage their campus and on-site recruiting programs. Employers can list jobs and internships directly on the school's jobs website which is available only for students and alumni from the school. 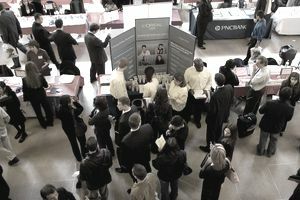 Companies also participate in campus recruiting programs, job fairs, career fairs, as well as offering information sessions to provide students with information about the company. For students and alumni, college recruitment programs are an opportunity to discover more about potential employers, to apply for jobs and internships specifically posted for candidates from your school, and to meet with companies on campus and/or by invitation to the company's offices. The following is a list of typical college recruitment programs. The types of programs offered vary by school. Depending on the school, visit the career services office and/or the alumni office website for details. Campus Interviews: Companies which hire a large number of entry-level candidates may come to campus to recruit. Students (and alumni, if eligible) apply for open positions. The company schedules campus interviews with selected candidates. On-Site Interviews: Companies who opt not to visit campus may post jobs and invite applicants to interview at the organization's office. Second interviews may also be held on-site for candidates selected for further consideration after a campus interview. Phone Interviews: Phone interviews are often used to screen college candidates because it saves the expense of visiting campus or providing transportation for the student or alumni to the employer's site. Career offices may provide interview space with a landline for interviews. Video Interview: Video may be used for long-distance interviews. Students may be able to interview from their computer in their dorm room or their university may offer computers and webcams for interviews. Information Meetings: Information meetings and information tables, usually held in the campus center, are used to promote awareness of organizations and reach students who may not be aware of available opportunities. Campus Job and Career Fairs: Campus career and job fairs provide means for employers to meet with many applicants and vice versa. Each employer participating in the career fair has a table where they provide information on the company and available opportunities. Candidates will have a few minutes to talk with each company representative. Off-Campus Recruiting Programs: Many college consortiums participate in multi-employer off-campus recruiting programs. Students from all the colleges in the consortium attend an interview with employers. Some programs also have a career fair component so applicants have an opportunity to meet with employers in addition to those they are interviewing with. Career Networking Programs: Career networking programs are offered by career offices and alumni offices. They provide an opportunity for students and alumni to engage with other alumni either in a campus setting or off-campus. These types of programs provide the opportunity to learn more about alumni career paths, as well as for job search networking. To find out what recruitment programs are available, check with the career services office for information on available services for students, alumni, and employers.